The Birmingham Watercolour Society are very pleased to announce details of their forthcoming Spring Exhibition, which once again is to be held at the wonderful Granary Gallery, Weston Park, Weston under Lizzard, nr Shifnal. TF11 8LE This year the exhibition will run from 1st until 30th May 2019. This year The Wolverhampton Society of Artists held its Exhibition at the West Gallery at Wolverhampton Art Gallery. The Worcester Society of Artists held their annual exhibition at the Art Gallery and Museum in Foregate Street, Worcester. 2014 will see the 67th Exhibition of the The Worcester Society of Artists at Worcester City Art Gallery. The Birmingham Watercolour Society held an Autumn Exhibition this year at Worcester Cathedral, Worcester. 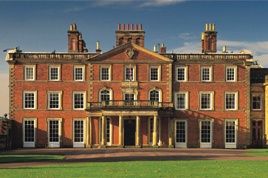 The Birmingham Watercolour Society held a Summer exhibition , this year at Hanbury Hall, Droitwich a National Trust Property. I had three framed pieces on sale there and three unframed. I sold one unframed during the exhibition. There a PAD Annual Dog Show from 11.30am -3pm again up in the main square of Mijas Pueblo. My pet portraits and portfolio of past commissions will be on show there. There was a PAD Spring Fayre from 11am -3pm up in the main square of Mijas Pueblo. I will be there advertising my pet portraits and also with my FairyNiceCreations stall , selling gift ideas. Wolverhampton Society of Artists Biannual Exhibition, Wolverhampton Art Gallery, Lichfield Street. PAD's held their Autumn Fayre behind the Nordic Centre on the Mijas Road in Fuengirola. I will be their with samples of my work. Wolverhampton Society of Artists BiAnnual Exhibition was held at Wolverhampton Art Gallery. Summer Exhibition - 'Detail and Decoration' at The Gallery at Bevere, Bevere Lane , Worcester. A group exhibition by ceramicists and painters. Annual Exhibition at Wolverhampton Art Gallery. Ceramic and Art exhibition -"Individual Voices" Ceramics by Craig Underhill, Emily Myers and Lisa Katzenstein and paintings by Alan and Claire Yates at The Gallery at Bevere, Bevere Lane, Worcester. Click here to see photos and invitation to launch party. "Alternate Creations" - This was a joint exhibition held by my father (Alan Yates) and myself. It was held at The Bevere Vivis Gallery & Picture Framers in Worcester and was on for one month.